Remove any heavy duty staple with ease! The large, spring-loaded lever handle and sturdy base provide stability while enabling the user to exert maximum force with minimum effort, reducing the risk of injury. Especially suitable for those already experiencing weakness and pain. Sturdy all-metal construction with satin finish for durability and appearance. The Cordless Rechargeable Stapler from Swingline offers effortless stapling - ready wherever and whenever you work, without the hassle of replacing the batteries! Powerful rechargeable batteries deliver 2,000 staples on a single charge based on durable motor-driven engineering, while the unit itself has an adjustable docking station for multi-angled desktop operation and convenient recharging (it can be stored upright to save space). Features include: a precision depth guide which adjusts staple to paper edge from 0.3125" to 1"; a low staple indicator for uninterrupted stapling confidence; a quick release button on top of the stapler for easy staple reloading. 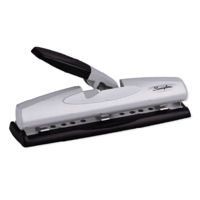 It can staple 2 - 20 sheets of 20 lb paper with Swingline's Premium Staples, and includes a battery pack with Ni-Mh rechargeable batteries and an instruction sheet. The Light Touch Lever Professional from Slimline is perfect for use in the home or office, making everyday punching 50% easier using its comfortable, soft-touch lever. It has a strong metal construction for long-lasting, reliable performance, with quality punch heads delivering clean cutting 0.28125" holes, which are also semi-adjustable for flexible multi-purpose punching. Punch capacity: 12 sheets of 20 lb paper (2-3 holes). 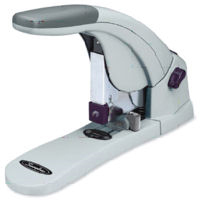 The LightTouch Heavy Duty Stapler from Slimline offers greater ease-of-use than most heavy duty staplers, handling 20 - 120 sheets of 20 lb paper with a single unique staple while using 30% less stapling effort. You won't have to change staples for different size jobs! Features include: one-button front-loading cartridge and an easy jam-clearing knob; versatile adjustment guide offers more precise horizontal and vertical alignments; exceptionally durable all metal construction. Uses LightTouch Heavy Duty Staples only. 5 year limited warranty. The LightTouch Heavy Duty Punch from Swingline offers a soft, comfortable grip handle for easy use, requiring 50% less punching effort than any punch in its class. It incorporates a breakthrough jam free feature, with punch heads and lever handle fused into one mechanism, delivering full pin control. Its top-loading design with pull up guide will keep paper steady while handling letter, A-4 paper and 2-hole and 3-hole configurations (up to 40 sheets of 20 lb paper). In addition, there are adjustable, replaceable punch heads for 2 to 7 hole applications (less than 40 sheet capacity when using more than 3 heads), and a paper alignment guide for accurate, professional results. The Electric Punch by GBC is capable of two or three hole punches. It can accommodate up to 24 sheets of standard 20 lb letter size bond paper. The holes are configured for either standard configuration 3 hole punch, or legal size document 2 hole punch. The number of holes to be punched is selected using the switch on the top of the machine. If the paper jams, a manual reverse switch is located on the side of the unit. 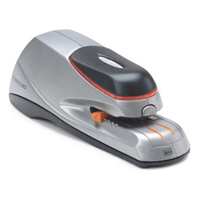 The Optima Grip Electric Stapler from Swingline electrically staples sheets with accuracy and consistency. This model has a 20 sheet stapling capacity and is portable. The stapler is designed for frequent use and is built for durability; you can also select automatic or manual mode of operation. It is plug-in or battery operated (AC Adapter included). This unit features a built-in staple placement guide and stack height gauge. 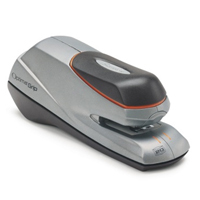 The Optima 20 Electric Stapler from Swingline electrically staples sheets with accuracy and consistency. 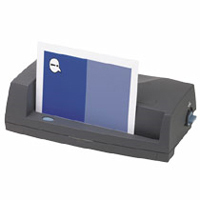 This model has a 20 sheet stapling capacity and is durable to withstand daily use. Manual or automatic operation, with both plug-in and battery power options. (AC Adapter included) LED light indicates low staple count. Convenient, built-in, detachable staple remover. Features a built-in staple placement guide and stack height gauge. This model has an adjustable depth guide for staple positioning of 3/8” to 1 5/8”. 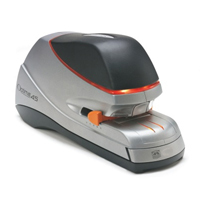 The Optima 45 Electric Stapler from Swingline electrically staples sheets with accuracy and consistency. 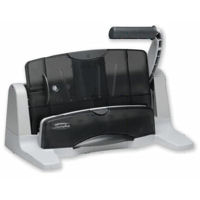 This model has a 45 sheet stapling capacity and is durable to withstand frequent, high capacity use. Manual or automatic operation, with both plug-in and battery power options. (AC Adapter included) LED light indicates low staple count. Flat clinch stapling makes neater stacks of stapled paper. 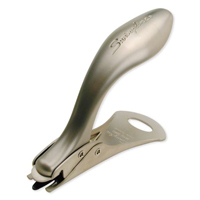 The stapler also has ¼” to 1 1/8” adjustable depth guide for staple positioning. This model also features a one-touch drawer that keeps extra staples handy.